I use and recommend the following. Some links below are my affiliate links. If you like my work, thanks for supporting me (at no extra cost to you). Like to see the updates of a bunch of nootropic, brain health, and self-improvement websites like I do? Well, I got a bunch on this page so you can see them all at once. Click the image above to check it out. If you like it, share it with your friends. Examine: Heavy-hitting researchers diving deep into analyzing supplements, vitamins, herbs, and other health topics to let you know what the current science paradigm says about each. 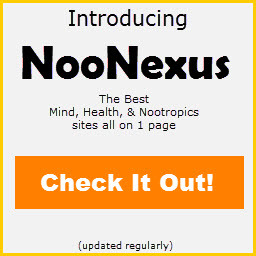 One of the best resources for checking out nootropics. Gwern.Net/Nootropics: Tons of anecdoctal, self-experimented, and extensive data/research on nootropics. 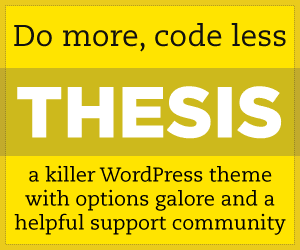 Thesis: The best damn WordPress framework on the planet. When you absolutely NEED the best performance. Most themes look good, but are sparse under the hood. Thesis does what a great framework is supposed to do: stay out of the way while giving you the best performance. The creator is detail-obsessed, has strong reasoning skills (look at the code when you cop it), and continuously improving his product. Nootroponaut is handcrafted and built on Thesis. If you want a workhorse site that’s fast, looks great on all devices, and performs like Tyson in his prime: look no further than Thesis.